To avoid uneven tread wear, and maximize the life of your tires, it’s important to rotate your tires regularly. 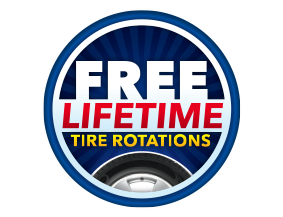 When you buy tires from us, you receive FREE tire rotations for the life of the tires. Rotating your tires means moving them from one side of the vehicle to the other, moving them from front to back or a combination of both. Since front tires tend to wear faster than rear tires on front wheel drive vehicles due to added pressure and resistance for steering, regulat tire rotation is very important. Regular rotations help avoid uneven tire wear which can lead to poor performance and decreased gas mileage. When should I have a tire rotation service? Tire rotations are typically recommended every 5,000 – 7,000 miles. Refer to your vehicle owner manual for the recommended rotation interval and pattern.